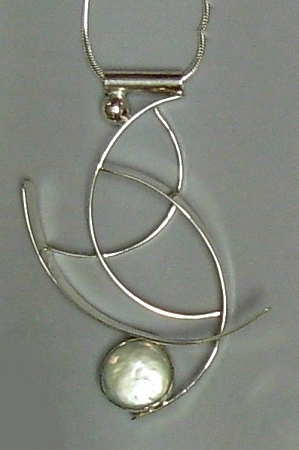 Curves Jewelry - This is a handcrafted artistic sterling silver pendant that features a cultured freshwater white pearl (13mm). This three-dimensional statement necklace comes with an 18" snake chain. Limited Edition Necklace. This is a handcrafted Sterling Silver Pendant created with wisps of silver to achieve an airy design. This design is accented by a white round fresh water pearl ( approximately 13mm in diameter ). The handmade pendant comes with an 18" Sterling Silver snake chain. This piece is from our "Wisps of Silver" collection. Signed and created by Aaron Rubinstein and Modern Art Jewelry.